In SharePoint Online I need to send email(s) when a user updates a document. Who this email goes to involves some fairly complex logic – which we’ll ignore for this post. So how do we send the email? SharePoint Online doesn’t allow you to use SPUtility.SendEmail() or System.Net.Mail.SmtpClient – so unless you’re using standard alerts, or the workflow “Send Email” activity, well, you’re going to have to look elsewhere. I didn’t think SharePoint designer Workflows were quite up to the complexity of it, so I started to look elsewhere – at Remote Event Receivers, provider-hosted in Azure. This leads to the question “can Azure send email?” I can imagine a few reasons why it maybe shouldn’t (think “spam”). 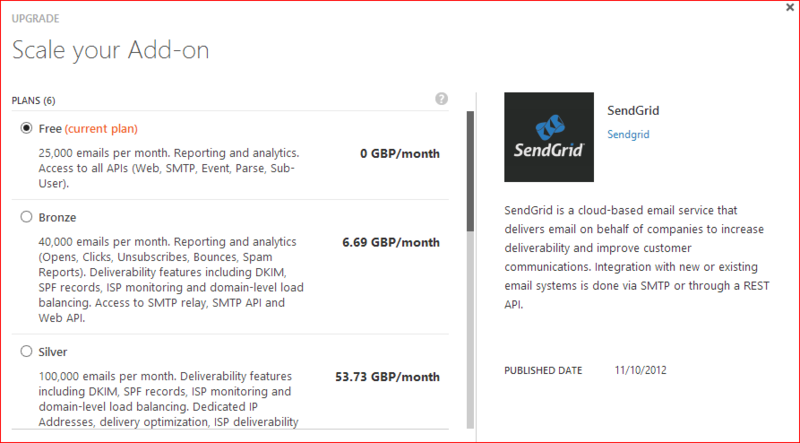 Well, Azure can’t send email, apparently – but it has an add-on “SendGrid” that can. I added it to the Azure instance (hint: make sure you have a valid credit card recorded against your subscription – mine wasn’t!) and started to try to follow some of the instructions on the ‘How to Send Email Using SendGrid with Windows Azure‘. // Create an email, passing in the the eight properties as arguments. // Create an SMTP transport for sending email. Username and Password are your account details from Azure. You can find them through the Azure Management Portal. I’m really not clear what you hand the GetInstance() function if you won’t want any CC or BCC addresses – zero-length arrays seem to work, but it feels a bit weird. Do not use NULL. This seems to cause some kind of error, but it’s a bit weird – no exception is thrown (that I could see), just the remote event receiver call terminates. So, sending email from Azure with SendGridPlus in an remote event receiver – pretty straight forward.